Everbuild All Purpose Weatherproof Wood Adhesive is a medium viscosity, resin based polymer emulsion which exceeds the water resistance requirements of BS EN204 D3. The product is also suitable for load bearing work as it conforms fully to the BS 14256 Sustained Load requirements. High degree of water resistance. D3 Classification - joints may be subject to short term water contact or exposure to high humidity. Water based, environmentally friendly/easy clean up. 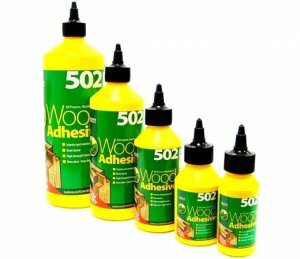 As a Weatherproof /creep resistant wood adhesive, internally and externally. Do not use at temperatures below 10 degrees C.
Note:drying time is extended at low temperatures. Ensure sufficient damping pressure, especially important with radio frequency bonding. Use on laminates: Only suitable for bonding small porous laminate strips. Do not use on non porous or large areas of laminate. Use contact adhesive. Apply adhesive thinly to both surfaces. Do not over apply as this will slow down cure. Clamp surfaces together until adhesive dries. (Off in 1-2 hours: full strength 8 hours). Support until fully cured. (8 hours at 20 degrees C). When fitting dowels, the adhesive should be applied to the holes. During storage, slight separation may occur (thin layer above thicker layer.) This is an esthetic rather than technical problem. In this case, shake well before applying.